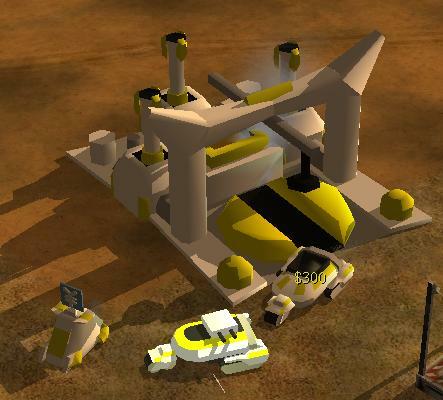 Well, I've gotten the japanese ore refinery and the two versions of the ore collector done. You toggle between the two modes; collector mode and gunner mode. Japanese Refinery cores are known for thier ability to quickly stake out and begin using supply stashes across the map. While they have the the ability to become wuickly sprawled out and decentralized, this comes with the threat of having a thinned out army in order to protect it's vast borders. To meet this challenge, Japanese engineers have equipted all collectors with light machine gun to ward off miner (get it?) threats until help can arrive. I am seeming to have trouble with coding this one; the miner comes out when the building finishes unpacking, but it does not automatically mine, it must be told to do so. I wonder what is up with this. Copy the code from the China Supply truck? I dunno if you did. I did. I think it has something to do with the Refinery being spawned from another unit and bot built. Hmm, check the AI modules in both the harvester and refinery, and make sure they match with the Supply Truck and Supply Center.